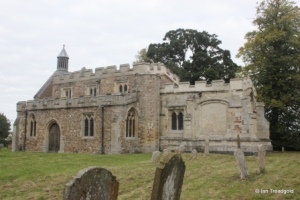 The church of All Saints in Eyeworth is situated to the south of the main road from Biggleswade to Wrestlingworth - the High Street which is the main road through the village. 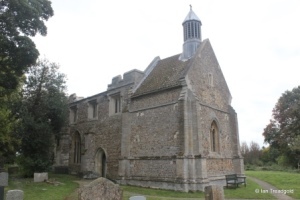 The church itself is at the end of a grassy track leading off the High Street. Parking is available at the end of this track. 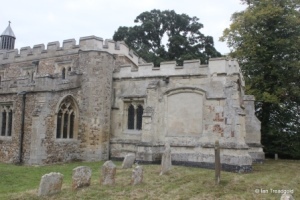 Known locally as the Church in the Fields the church consists of a nave, chancel, south aisle and west tower although the tower is a shadow of its former self following a major fire after a lightning strike in 1967. 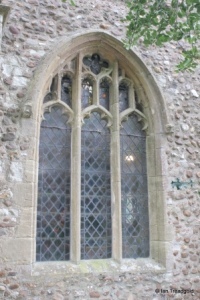 The south aisle has a C14 east window of three trefoiled lights under a two-centred arch with quatrefoil tracery above. 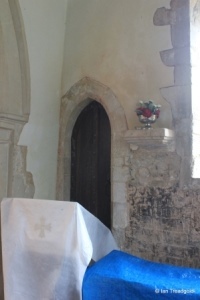 The south side of the aisle has two windows on either side of the unporched south doorway. 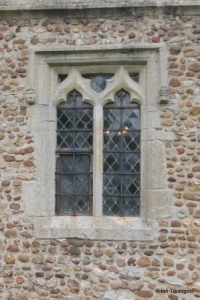 The eastern window is of two trefoiled lights under a square head with corbels on the hood moulding. 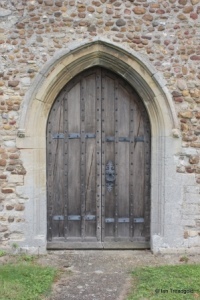 The south doorway is in a two-centred arch again with corbels on the hood moulding. 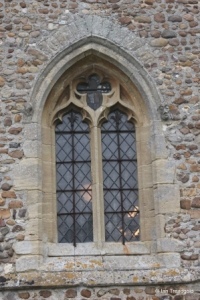 The western window is of two trefoiled lights under a pointed arch. To the west of the aisle is a simple quatrefoil design in a square frame. 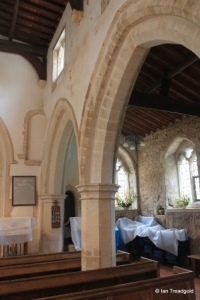 The clerestory above has three two-light trefoiled windows under square heads on each side. 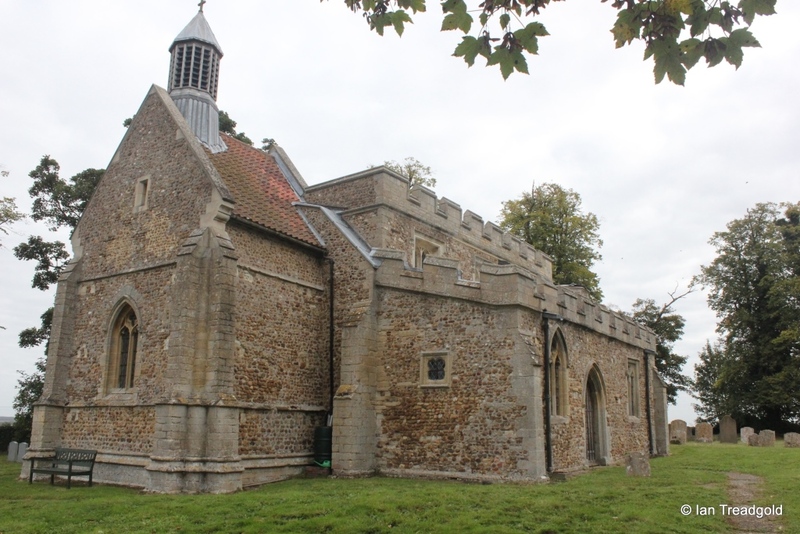 The church is embattled throughout although the parapet on the north side appears to have been partially removed, presumably due to damage. 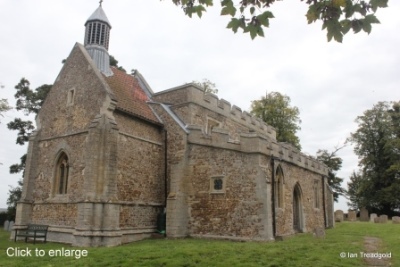 The tower was originally built in C14 as a tower with spire above and would have been an imposing sight for a what is a relatively small church. However a lightning strike and resulting fire on the 20th September 1967 destroyed the tower and spire. 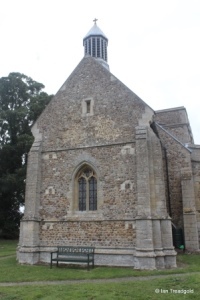 The modern bell turret and tiled roof were built onto the remains and dedicated on 6th November 1970. 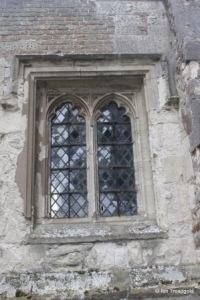 The west window of the original tower remains and is two wide trefoiled lights under a pointed arch with an elongated quatrefoil design in the head. 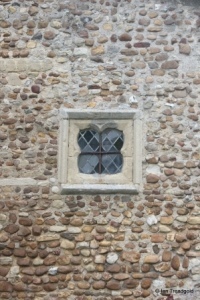 The north wall of the nave has just one window to the east of the unporched north door. 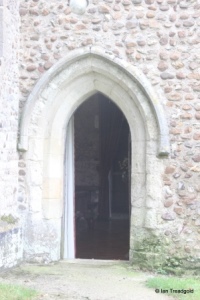 The doorway is under a pointed arch and the window is of three cinquefoiled lights under a two-centred arch with perpendicular tracery above. 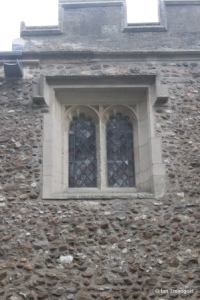 The chancel has a single window on the north side of two cinquefoiled lights under a square head. 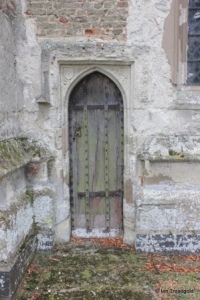 To the east of the window is the priest's door under a pointed arch with heraldic designs in the spandrels above unfortunately now badly eroded. 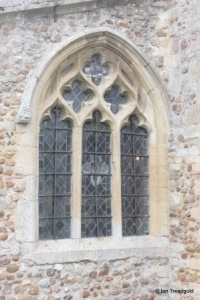 The east window is of three elongated cinquefoiled lights under a four-centred arch. 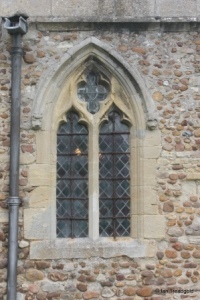 The glass in the window was inserted in memory of Ellen Francis Peel who died in 1900. 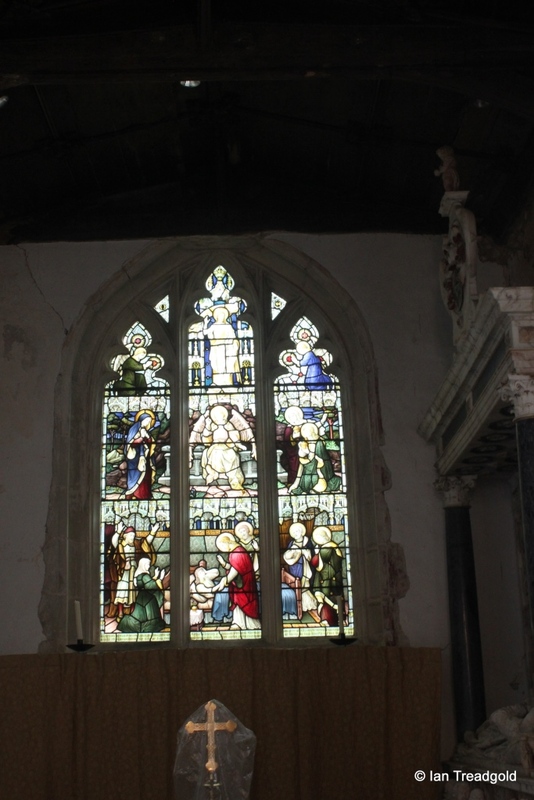 Fragments of the original east window glass were moved to the window in the north aisle at this time. 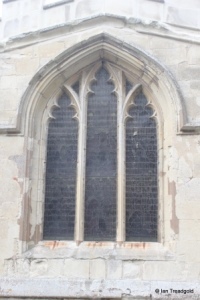 The south side of the chancel has just the one window now, matching that on the north side being of two cinquefoiled lights under a square head. 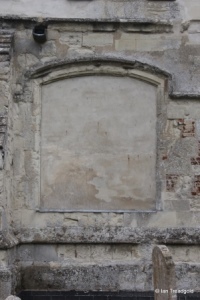 To the east of this window is a now blocked large window opening under a depressed four-centred arch. 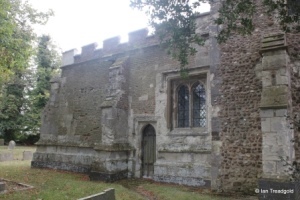 Inside there is the altar tomb of Sir Edmund Anderson (1530-1605) who was Chief Justice of the Common Pleas under Elizabeth I and sat as a judge at the trial of Mary, Queen of Scots. 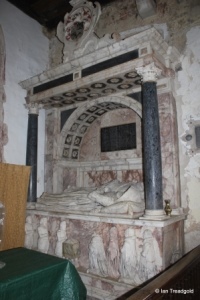 The chancel also has a monument on the north side to Sir Francis Anderson (c1574-1616) son of Sir Edmund Anderson. 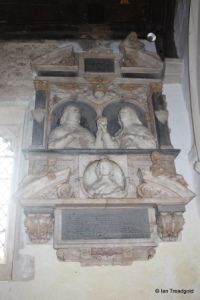 Included on this monument are effigies of Sir Francis and his two wives, Judith and Audrey. 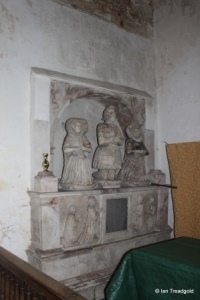 To the south west of the chancel is a third monument to the Anderson family, Edmund Anderson (1607-38), son of Sir Francis. 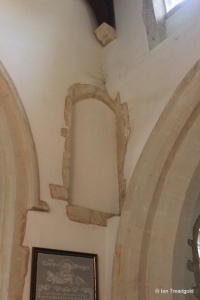 In the angle between the chancel and the south aisle are signs of the internal rood stair leading from a door at the east end of the south aisle up to the now blocked rood stair. Page last changed 04/10/2014. Reformatted 14/02/2016.